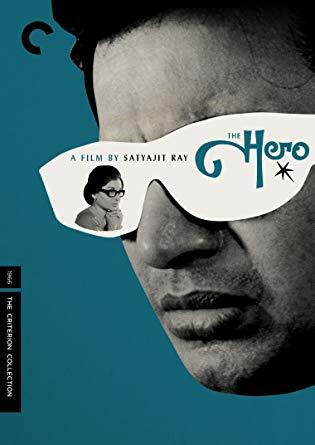 The Hero – like many of Ray’s films – is an elegant contemplation on the human condition and the myriad of emotions it entails. Just as there are countless novels with a writer as the protagonist, the actor and the travails of his profession have been often featured in cinema. From Singin’ in the Rain to Birdman, Hollywood has made movies about making movies. This trope isn’t limited to American cinema. 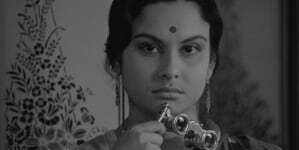 In 1966, Satyajit Ray made The Hero, a character study about a star actor on the precipice of his first box office failure. 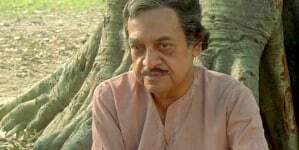 Taking place mainly on a train journey from Kolkata to Delhi, The Hero – like many of Ray’s films – is an elegant contemplation on the human condition and the myriad of emotions it entails. It is important to remember that while Ray created one humanist drama after another, the majority of the films produced in India came from Bollywood, escapist matinee fodder featuring flashy villains, gossamer plots and numerous song and dance numbers. Though Ray’s title, The Hero, may be somewhat sardonic, his film is a sensitive portrayal of a leading man who not only embodies everything his fans want in a celebrity, but is also comprised of multiple, shifting layers of complexity. 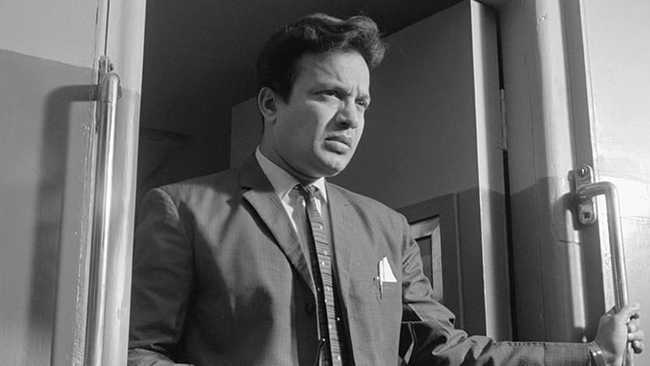 We first meet Arindam Mukherjee, played by real life mega-star Uttam Kumar, as he prepares for a journey to Delhi to accept a reward. One of the biggest stars in India, Arindam’s celebrity is about to lose its luster. He fears that his forthcoming film will be a flop and he is in the papers for inciting a brawl in a bar. Ray is mining familiar territory in a film about a character dealing with regret, but once Arindam steps onto the train, the director tries his hand at something new: dream sequences and flashbacks. As we travel with Arindam, Ray begins to show us the different events that led to the formation of this box office hero, vignettes of formative events including the death of his mentor to the shunning of his activist best friend because aligning with his revolutionary politics could be bad for his career. Ray could have easily spent the entire film examining Arindam, but we also meet his fellow travelers on the train. Each is suffused with their own desires and needs, and as Arindam (and Ray’s camera) drifts in and out of each situation, the actor becomes exactly what they need. The passenger that intrigues Arindam most is Aditi Sengupta (Sharmila Tagore), an attractive journalist who believes the actor is nothing more than a pretty face. Writing for a magazine called Modern Woman, and a strident modernist at that, Aditi sees the actor as a way to increase her circulation and thus begins a series of interviews where she peels away the layers of self-doubt and fears that created Arindam while learning that she herself is not infallible. The Hero is also about India ceding to the trappings of Western culture. Arindam idolizes Bogart and Brando, wearing wrap-around shades and dark suits. He is a drinker, much to the chagrin of an old passenger, and even makes a reference to cocaine. As the train makes its way to Delhi, the landscape outside the windows looks like it hasn’t changed in centuries. Arindam isn’t the only person on the train feeling empty. There is an advertiser, a housewife and numerous others who find lack of purpose in their “modern” positions. Throughout The Hero, Arindam’s primary concern is the box office returns of his films. In one of the flashbacks, Arindam remembers when a former star comes to him and begs him for a role. By talking to Aditi, who eventually tears up the salacious tell-all interview, Arindam realizes the blessing and responsibility that comes with his station in society. After nearly losing himself on a drunken evening, the actor comes through for his fans at the end. Ray doesn’t tie up Arindam’s story neatly. He leaves those types of conclusion for Bollywood. But the actor has definitely journeyed somewhere on his trip to Delhi, and though some sort of understanding was achieved, Ray leaves it up to the audience to determine exactly what. 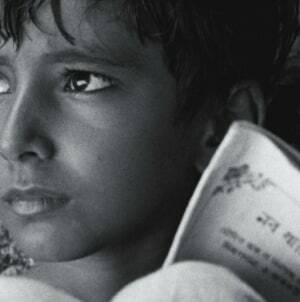 Satyajit Ray’s Apu Trilogy is a treasure trove for film buffs.